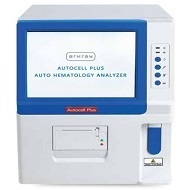 Autocell Plus (New) | ARKRAY, Inc.
20 parameters + 3 Histograms. Dual Sample Mode & Small Sample Volume. Comprehensive built-in QC program for upto 10 lots with X-R,XB, X D CV vaue. Dual chamber for WBC & RBC makes faster test results with more accurate & avoids cross-contamination.